Many names refer to this green cruciferous vegetable, so it is easy to get confused. Examples include broccoli raab, broccoli rabe, Chinese broccoli, rapine, rapini, turnip broccoli and rappi (to just name a few) but they all actually refer to the same vegetable. 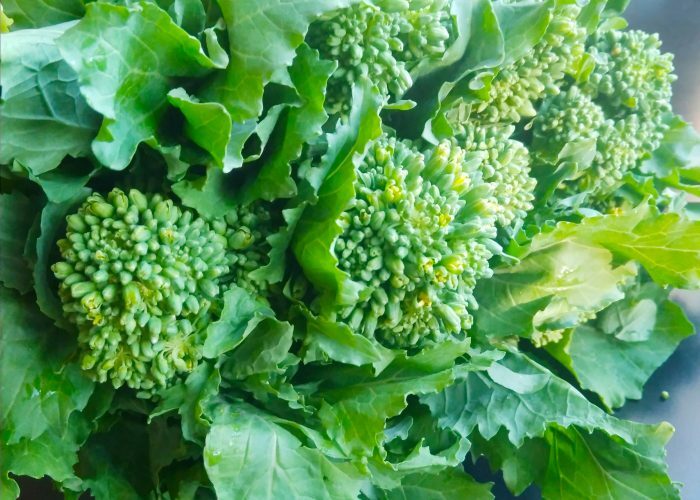 Broccoli raab comes with green flowery like leaves, small florets that resemble broccoli and often pretty yellow miniature flowers. Despite its name, however, it is actually more related to turnips. In terms of nutrition, broccoli raab is a good source of nutrients such as calcium, vitamin K, vitamin A, potassium and folate. A 100 grams of this cooked vegetable (about a quarter of a cooked bunch) yields 3.8 grams of protein, 2.8 grams of fiber, 118 milligrams of calcium, 1.3 milligrams of iron, 343 milligrams of potassium, 37 milligrams of vitamin C, 4533 International Units of vitamin A, 2.53 milligrams of vitamin E and 256 micrograms of vitamin K.
So…how do you cook it? Though unwieldy appearing, broccoli raab is almost as easy to cook as its unrelated namesake broccoli. You don’t need to strip the stems. Just simply wash, then chop to separate the thicker long stems from the section of leafy greens, florets and tender stems. Start by sauteing the thicker stems first in some olive oil and chopped garlic before adding in the leafy greens, florets and tender stems. You can also cook and eat the edible little yellow flowers if found in the bunch. Alternatively, you can steam, broil, stir-fry or add chopped broccoli raab to soups, pasta meals, casseroles, or other baked dishes. If you would like more tips on how to use and prepare broccoli raab, refer to this useful article. Broccoli Raab/Rapini. What’s Cooking America. https://whatscookingamerica.net/Vegetables/BroccoliRaab.htm. Accessed March 12, 2018.